Students who participate in extracurricular activities reap the benefit of the total St. Thomas educational experience. Student organizations provide avenues for cultural and spiritual growth. Students who participate in school publications, clubs and activities make friends who share their interests and develop character through performing acts of public service. This student led club allows students to meet other likeminded peers and provides the space and time for them to develop their artistic interest. Past projects have included paper mache, portraiture, watercolor, etc. Assist the head athletic trainer with first aid, hydration, rehab, and treatment of STH athletes. The Book Club fosters and encourages a love of reading and provides a forum for interesting, intellectual conversation. Senior Leaders are a highly selective group of seniors who are commissioned to assist Campus Ministry with student retreats, student liturgies, and various ministry offerings at STH. Senior Leaders give Witness Talks on student retreats, faciliate small groups on student retreats, and serve as liturgical ministers at student liturgies. Senior Leaders also are invited to a special leadership camp during the summer prior to their Senior year. The Chemistry Club is open to all STH students. The club will explore the applications of chemistry and participate in many school activities such as Open House. Students will be responsible for providing demonstrations at the Open House event. The purpose of the this club is to take chemistry beyond the classroom to everyday applications. The Chess Club meets on Monday and Thursday afternoons in Mary Moody. Chess Club activities appeal to both the recreational and tournament-competitive mind set. As such, beginners and casual players are always welcome. The Choices Club meets once per week and members develop creative ways to disseminate Choices Program information to the wider student community. The STH Drama Club is a group like no other on campus. Comprised of students from St. Thomas, St. Agnes, Duchesne, and Incarnate Word, the 70+ students performs two major shows every year. The students, parents, alumni, little brothers, little sisters, and faculty all work together to produce these magnificent shows. No experience is necessary! Eagles for Life promotes a respect for life in all of its stages: from womb to tomb. We have a fall presentation to all of the Theology classes along with several prayer rallies and service projects. FCA "is an interdenominational Christian sports ministry to see the world impacted for Jesus Christ through the influence of coaches and athletes." STH has a very popular and active FCA huddle. Students and coaches gather bi-weekly for a Friday morning bible study, faith sharing, and fellowship. FCA at St. Thomas also includes occasional special guest speakers (current and former Professional athletes, alumni, coaches), social events and leadership development. The Francophone Club meets once a month. They pick a French speaking country to present. The members cook or bring one specialty dish from the country that is being presented. The Intramural Sports Club provides students with an opportunity to play a variety of sports and games in a fun, noncompetitive after-school setting. The Java Competition Team is an opportunity to enhance your logic and programming skills. We meet once a week on Wednesdays after school to practice and prepare for competitions. Student led organization that tutors middle school students weekly at St. Theresa's Catholic School and elementary school students at Memorial Elementary. The St. Thomas Math Club meets every two weeks on Tuesday during Lunch/Flex period to provide students an opportunity to engage their enjoyment of learning and doing mathematics, enriching their understanding of math by discovering more of the wonders and challenges of which mathematics consists. It is our aim to accomplish this through student presentations and student-led discussions, as well as weekly work – most often by small groups – on problems whose interest and challenge go beyond what a classroom can provide. We also prepare for and participate in high school math competitions. The Math Club is open to all interested students. Coming soon - Mu Alpha Theta Mu Alpha Theta is a national honor society for mathematics. STH is beginning a chapter of Mu Alpha Theta in the Spring semester. More information coming soon. A simulated United Nations conference in which students will role play as country representatives and debate significant international issues. Preparation involves meeting twice a month in the fall and weekly in January in preparation for the two day conference in early February. 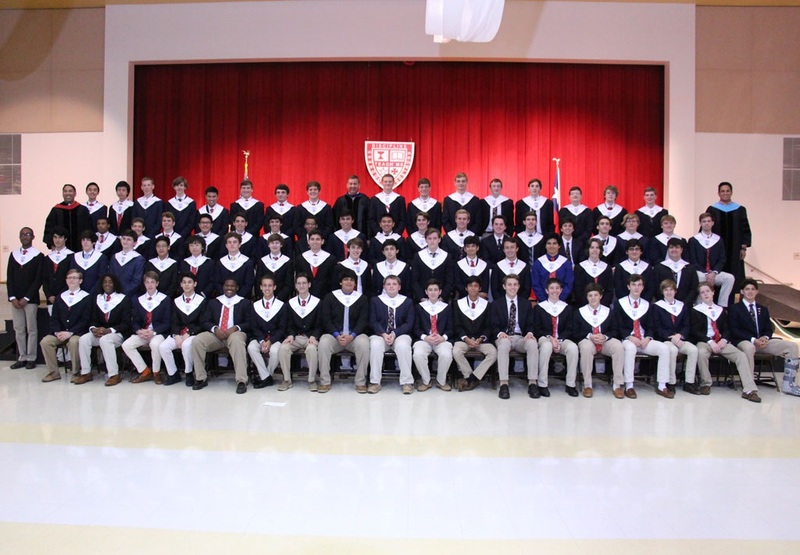 The St. Thomas Chapter of the National Honor Society strives to combine the mission of the school, upholding goodness, discipline, and knowledge, with that of the National Honor Society. We are an organization that recognizes and encourages superior academic achievement while developing other characteristics essential to citizens in a democracy. In the St. Thomas Chapter of NHS, we prepare future leaders for global citizenship through each member’s commitment to superior learning, leadership development, school and community service, and the very highest standards of character. Being a member of the St. Thomas Chapter of the National Honor Society is an honor and a privilege. The Pre-Med Club hosts speakers from various branches of Medicine as well as others who work in life-science related fields. The club also assists with the annual blood drive and also supports other memdical causes by participating in walk-a-thons throughout the school year. Highly competitive, team-based, academic competitions via trivia tournaments. Students build robots in the VEX robotics system and complete locally with other schools. This is both a mechanical engineering as well as a programming challenge. Competitions are held at the state, national and international level. Practice is on Tuesdays after school. Students design, build and launch model rockets in the annual TARC (Team America Rocketry Challenge) competition. The Rocketry Club meets yearlong on Wednesdays after school and on selected Saturdays in the Spring semester to launch at Johnson Space Center. The Spanish Club at STH promotes the language and cultures of the Spanish-speaking world through a variety of fun and educational co-curricular activities and service opportunities, which allow students and faculty to interact, practice spoken Spanish, and learn about the richness and diversity of Hispanic cultures. The Speech and Debate Club is fun way to develop communication skills and make new friends. 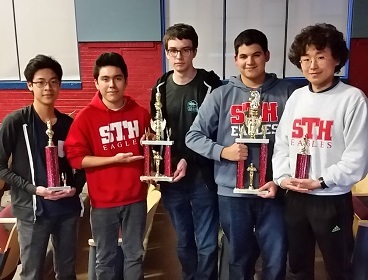 This group competes in speech tournaments around Houston and across the nation. Meetings are held on Mondays and Thursdays after school, except Thursday faculty meeting days. The purpose of the Student Council is to give students an opportunity to develop leadership by organizing and carrying out school activities and serving as a liaison between the student body and the Administration. It is the group where students can assume as much of the responsibility of organizing their activities as they are able, and where questions arising from the students can be presented. It derives its power from the Administration, and its prime objective is to promote school spirit, pride and unity. Get involved in the voice of STH by joining in on completely student-run media: The Eagle Newswpaper and website, Aquin Yearbook and website, and the Eagle Broadcast Network. Whether it's writing, layout, photography, graphic design or social media, there are a variety of fields you can specialize in and learn more about journalism and communications. Learn what it takes to put together nationally-award-winning media and build your skill set to be successfull in college media and communications internships. Participate in live event coverage on social media or be an anchor on the daily morning news. Anyone is eligible to join. The Ultimate Frisbee team is an intramural program in which students learn to play Ultimate Frisbee competitively from other students. We play against other local schools throughout the year as well as compete in a state tournament in May. Practice is on Fridays after school from 3:15pm - 4:30pm.